This is by far one of my least favorite issues of Amethyst. I fortunately was able to remain ignorant of this issue for many years, because I skipped it when I was originally collecting the series and didn’t read it until many years later when I got a complete run of the series from Ebay. 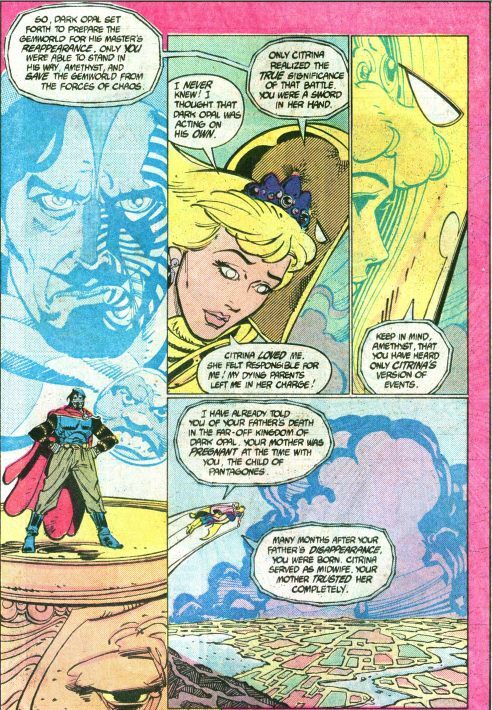 Amethyst gets pulled into larger DC comics continuity through some retconning involving the Lords of Order. The explanation involves making Citrina much more sinister than I would have expected. Dr. Fate carries Amethyst through the dimension between worlds. She thanks him for helping him out because she’d never be able to find her way back to the Gemworld in the dark. Dr. Fate tells her that their way is lit by the light of a thousand suns. Amethyst wonders why she can’t see, and Dr. 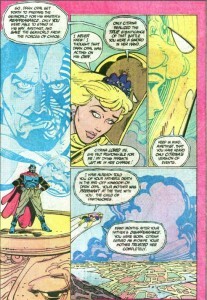 Fate reminds her that she was blinded when fighting in the Crisis on Infinite Earths. Amethyst asks if she’ll be able to see again and Dr. Fate replies “Put aside all such wishful thinking.” She wonders why he is being so mean, and he tells her that her struggles have just begun. He’s going to tell her the true history of the Gemworld, and it is nothing like the stories she heard from Citrina. Citrina told Amethyst that her parents lived in a Castle, but Dr. Fate says that it was actually a heavily armed fortress. Amethyst’s father saw that Dark Opal had joined forces with the Ancient Ones, but his ultimate goal was to use the Ancient Ones to open up the Gemworld to the Lords of Chaos. 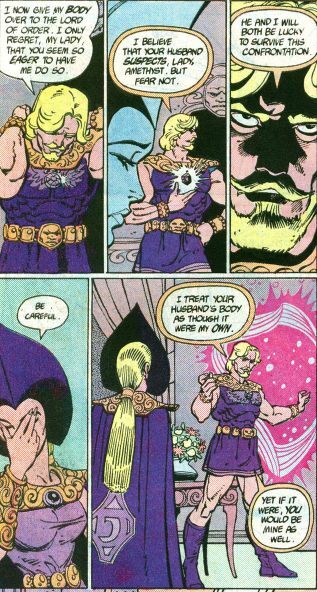 Amethyst’s father grabs a necklace that houses a Lord of Order, wondering why his wife seems to eager to have him leave. 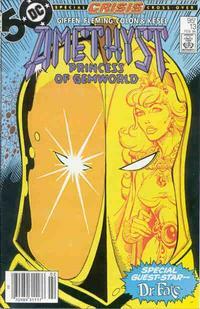 Amethyst’s mother has been having an affair with the Lord of Order who possesses her husband’s body. As he heads into battle the Lord of Order thinks that he’s responsible for introducing the element of chaos to the Gemworld due to his passion for the Lady Amethyst. Dr. Fate tells Amethyst that she is the first Lord of Order in human form. Her father, in his Lord of Order form named Pantagones, confronted Dark Opal and a demon named Vandaemeon. During the battle a magic bolt from Opal reflected through Pantagones’ jewel, striking Vandaemeon. Pantagones’ host body is vaporized. Vandaemeon decided to punish Opal, afflicting him with the striped face that readers of Amethyst are quite familiar with. Opal had the opportunity to erase them, one evil deed at a time. Citrina stole Amethyst from her mother, whisking her away to Earth. 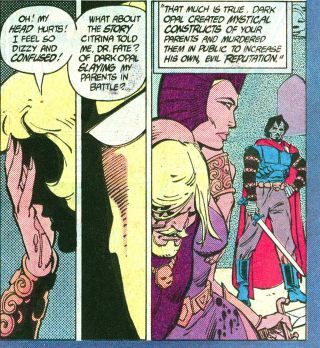 Dark Opal later found Lady Amethyst and tortured her to death. Amethyst says “Oh! My head hurts! I feel so dizzy and confused!” I think most readers at this point are also dizzy and confused. Amethyst wonders about the story that Citrina told her about Lord and Lady Amethyst being killed in battle by Dark Opal. Dr. 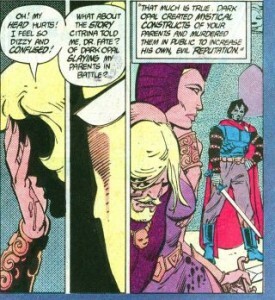 Fate tells her that “Dark Opal created mystical constructs of your parents and murdered them in public to increase his own, evil reputation.” OOOOKKKAY. Dr. 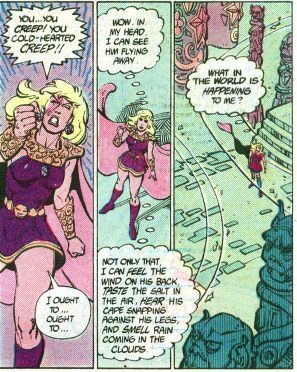 Fate says that it is now Amethyst’s job to rid the Gemworld of Chaos, since she is the only representative of Order left on the world. Amethyst realizes that Dr. Fate has taken her to the temple of the Ancient Ones and begs him to take her away because she can’t confront them when she’s blind. He tells her to act like a Lord of Order and see with other senses. Amethyst discovers that she can form mental images of her surroundings. The Ancient Ones have deserted their temple. Next issue: Carnelian is back! This entry was posted in comics and tagged Amethyst Princess of Gemworld on 3/2/2009 by Anna.